We continue our series on the top draftable players entering the 2013 season. Today we discuss the center position. The center position is normally the anchor of the offensive line. Centers need to be smart players that can read the defensive front and call out blocking and protection schemes. They also need to be able to handle direct snaps and shotgun snaps. This is our list of the top 5 centers for the 2014 draft. Bryan Stork was a 2nd team All-ACC selection last year. He is the veteran of the Seminoles offensive line with 27 starts and 35 games played prior to this season. Stork is tough and has great quickness and movement skills. He has played center, guard and tackle in his career. Stork is one of the keys to the Florida State rushing attack and he can be a dominant run blocker. The Seminoles will be starting a young, inexperienced quarterback this season and Stork will be depended upon to bring leadership not only to the offensive line, but to the entire offense. Stork is an extremely competitive player that sets a physical tone for the entire offense. 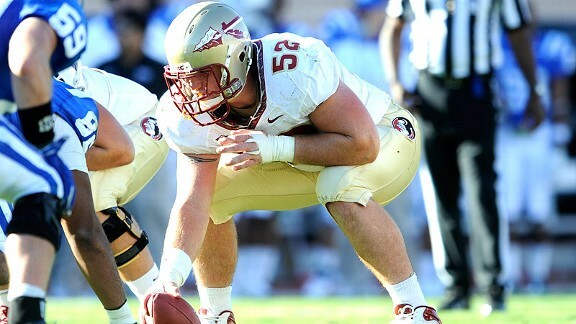 Last season Stork graded out at 85.6% which led Florida State linemen. Travis Swanson is starting his fourth year as a starter for the Razorbacks and has started all 38 games of his career. He was selected to the 2nd team All-SEC team in 2012. Swanson has been a team captain and leader of an offensive line that has set multiple team and SEC records in the last three years. New coach Bret Bielema loves to build his teams around a solid offensive line. The last two centers to play under Bielema (Peter Konz and Travis Frederick) were high NFL draft picks. Swanson should only get better under the coaching of Bielema. He has long arms and is stout at the point of attack. Swanson has good size and does a good job in pass protection. He understands blocking angles, but can be beaten inside with quick moves. Gabe Ikard was a 2nd team All-Big 12 selection in 2012. He was asked to move to center when Ben Habern retired from football due to injuries. Ikard actually played better in 2011 when he played guard, being selected 3rd team All-American and 1st team All-Big 12. You have to give him credit for moving to help the team though. Ikard struggled at times last year with shotgun snaps. Hopefully after a year of playing the position, he will clean that up a bit. I believe he projects to a better guard than center in the NFL, although his versatility will be something that will make him attractive to NFL teams. He has 37 starts in his career, 19 at center and 18 at guard. Ikard has good movement skills and has good strength. He is a smart player that was on the Capital One Academic All-American 1st team. He is a bit undersized, being just less than 300 pounds, but he should be able to add a few pounds. B.J. Finney was a 1st team All-Big 12 selection last year. He is a former walk-on who has become a team captain. He has started all 26 games since the beginning of his redshirt freshman season. Finney has fought through hardships to become one of the best centers in the country. He is intelligent and works extremely hard. Finney moves well for a man his size and he has the strength to push defenders off the line. He may need to put on a few pounds to get ready for the next level, but that should not be a problem. Tyler Larsen has 38 straight starts at center for the Aggies. He was selected to the 1st team All-WAC team the last two years. Larsen makes all the line calls and is the leader of a very experienced offensive line that has a combined 110 starts. He has a great football IQ and understands the intricacies of playing offensive line. Larsen is a high effort guy that tied for the team lead among the offensive line with a grade of 86% and had four games where he graded 100%. This entry was posted on August 22, 2013 by draftmaniacs in Top 5 at each position and tagged 2014 NFL draft, arkansas football, B.J. Finney, Bryan Stork, Florida State football, Gabe Ikard, Kansas State football, NFL Draft, Oklahoma football, Razorbacks football, Seminole football, Sooners football, Travis Swanson, Tyler Larsen, utah state football.